The Man is coming for your weed, but only to keep an eye on it. Probably. Lawmakers in Colorado introduced a new bill that would use a chemical agent to track marijuana sales and record them on a secure blockchain ledger. But residents are already fighting back — even though the chemical itself hasn’t even been invented yet. Colorado decriminalized marijuana in 2012. But as with any legal industry, illegal deals still go down. For example: Sometimes dispensaries sell marijuana that wasn’t grown in a licensed dispensary, or violate regulations by shipping it out of state. And with the industry booming — it raked in more than $1 billion in 2016 — it’s not hard to imagine illegal growers wanting a piece of that pie. Which is why it makes sense for lawmakers to want to keep a closer eye on the product sliding across dispensary countertops. But how can blockchain, the popular technique used to secure everything from photo ownership to genomic information, be used to track it? 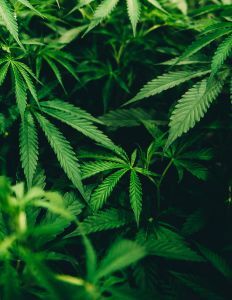 Here’s their plan: each plant would be dosed with a chemical agent to the marijuana plants that, when scanned, would reveal whether the plant was grown and sold by a legitimate marijuana business. The bill doesn’t even explain how the new regulation will affect other elements of the market, either. For example, currently, adult Colorado residents are legally allowed to own up to a dozen marijuana plants, and give marijuana away to other people. How would the new requirement would affect those residents? No one knows yet. And then there’s the theoretical chemicals sprayed on the plants. If the chemical tracking agent can be absorbed by the plant, could also be absorbed by the human body? Patrick Vo, CEO of BioTrackTHC, told Motherboard. In that case, would an individual be just as easy to track as your neighbor’s shady weed? For now, these questions are impossible to answer, because, again, the chemical in question doesn’t even exist yet. Colorado state senator Kent Lambert, one of the bill’s primary sponsors, knows Colorado residents aren’t happy about the bill. “There’s a lot of misunderstandings about what the bill does and what it doesn’t do…[it is not] intended to have some sort of tainting of the plant…the intent is to it go through the same kind of stringent screening from the Health Department before any of this sees the light of day,” he told Motherboard. Lambert and his colleagues’ seem to have good intentions, but the paranoia of people spraying chemicals to track organic matter on the blockchain? Understandable. And, of course, weed-induced — in more ways than one.